Bookshelves are not just a backdrop in a room, but a major focal point. They even have their own special hashtag - #shelfie. You might think they are only for books, but the most interesting shelves showcase framed photos, objects and art, as well as great books. When faced with a wall of empty shelves, even a design pro can lose courage. Or, more daunting, is a collection of items that don’t work well together. The successful ones highlight the wall with a pleasing visual tension through shape, texture, and color, and not just stacked books. Your choice of books, from the latest designer coffee table gems, to classic tomes, can create a visual facelift in seconds. Think colorful dust jackets on your books to give a pop of color. Though, a strong statement of black and white is another design staple that can be used for a dramatic effect. Place books vertically and horizontally to create interest. A horizontal stack can be used as a base for a special object. Books are a strong component in defining the overall structure of the display, if used correctly. Sometimes you need to update your books. Longoria Collection has taken on the task of sifting through new titles for interesting content and shelf appeal. We’ve chosen the best in design books from publishers such as Assouline to Rizzoli. Frames are another, often overlooked, quick fix for the shelves. Look for frames with clean lines and a uniform look. A mix of frames in wood or silver, or other materials, is distracting to the eye. Uniformity is your friend when grouping beloved photos for display. LC stocks frames, in all price points, to help you make the transition. Interesting objects are another great resource when styling bookshelves. These can be treasures gleaned from a life of collecting, or items that currently speak to your personal aesthetic. Now is the time to have fun with displaying, and use items in unexpected ways. Think of the candy color acrylic trays, boxes and bowls from AVF. Trays can be used vertically as a backdrop, creating a sort of frame for the objects in the foreground. An AERIN box can sit on top of book, and find importance on the shelf. A pair of kicky Kelly Wearstler brass legs can create the perfect fashion statement. Bookshelves are a great form of self expression. Look at your books and considering updating titles with an eye towards color and visual interest. Stack books vertically and horizontally. Edit your objects for the best impact. If you need to add to your collection, look at items form AERIN, AVF, and Kelly Wearstler, all available at Longoria Collection. Use objects in unexpected ways. Trays as backdrops, vases as objects, boxes on top of stacked books - creating a treat for the mind and discerning eye. Quick fix - uniform frame selection. LC recommends plain silver frames, when in doubt. We love our frames and keep a designer’s treasure trove of styles in stock, in all price points. 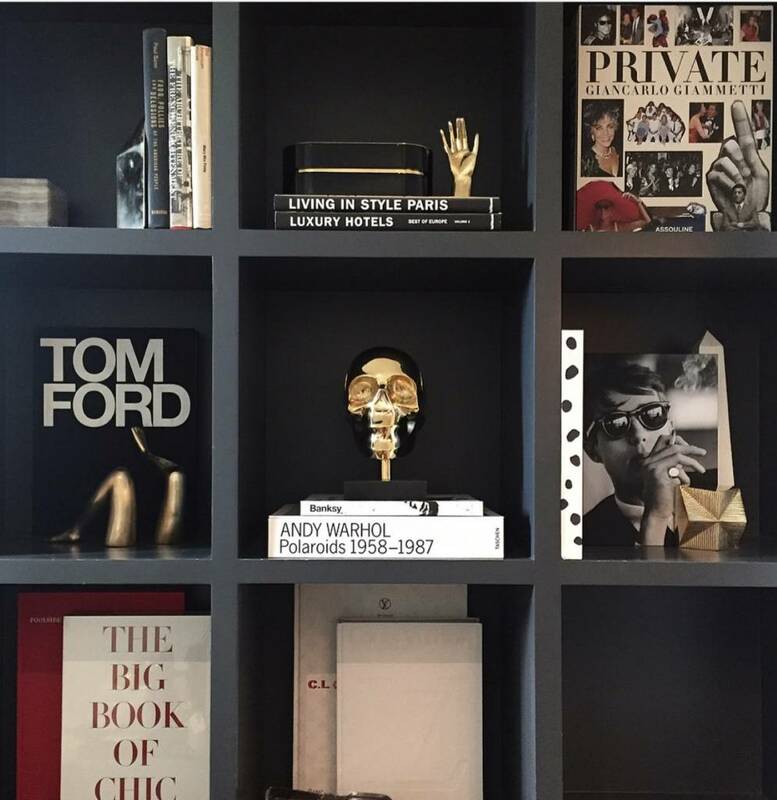 Alexandra Von Furstenberg's library at home.